This is going to be a quickie because I need to pack my heavy winter coat, scarf and beanie: I’m heading to Minneapolis for a quick trip. I’m kind of excited because I’ve heard so many awesome things. But I’m also kind of scared of the weather. It does look like there’s going to be a warming trend, so fingers crossed that my fingers don’t freeze! 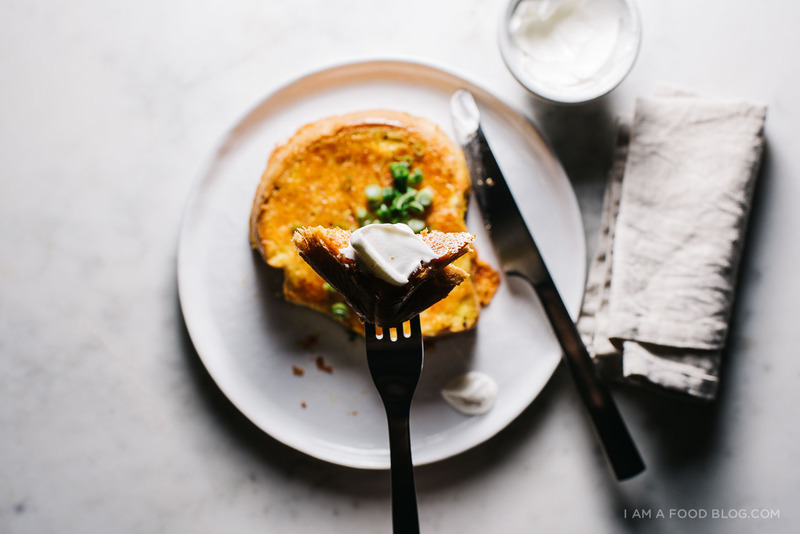 This cheesy french toast is just the kind of thing I love eating in cold weather. 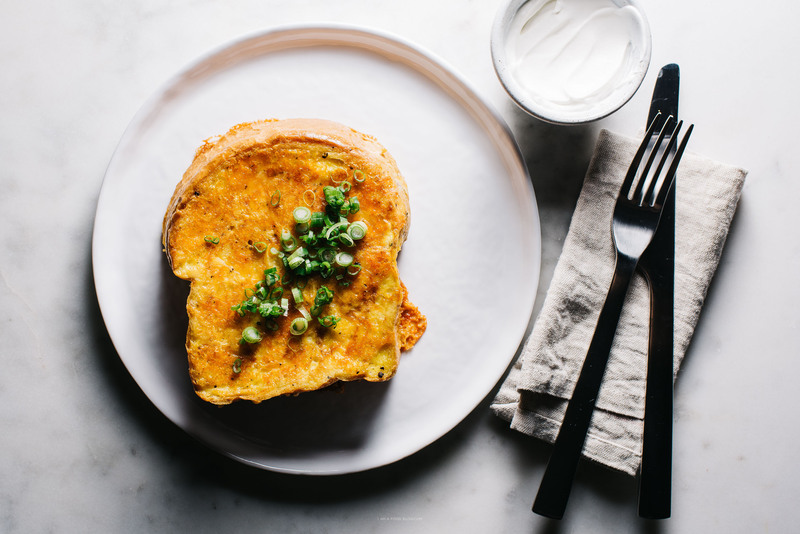 Cheesy, warm, eggy bread: what’s not to love? Essentially it’s French toast minus any sort of syrup, plus cheese. Because, cheese. The inside of the bread stays custardy, the cheese gets melty-crisp and with a dollop of sour cream it kind of sort of feels a little bit like eating a pierogi? Happy Sunday – stay warm and brunch up! 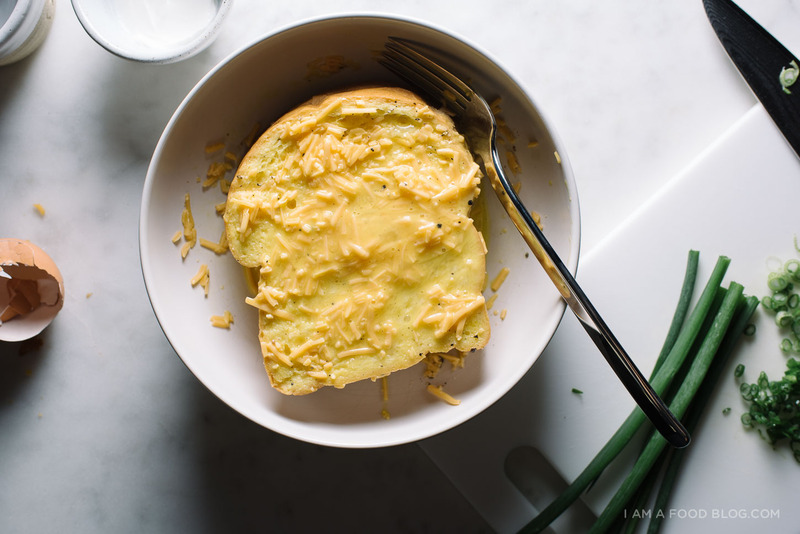 Whisk together the egg, milk, cheddar and a bit of salt and pepper.. Soak the bread on both sides while you heat up a non-stick pan over medium heat. 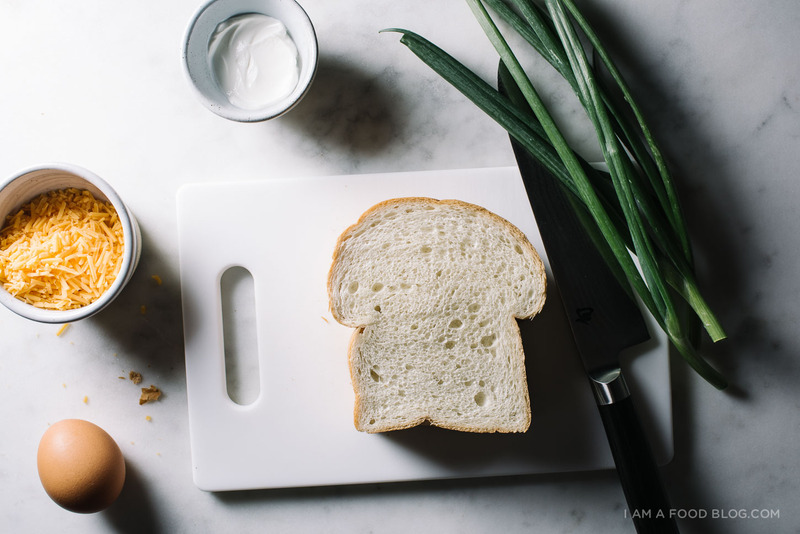 Heat up your oil or butter and add the slice of bread to the pan and grill until golden brown. Be patient and cook on medium to medium low so the cheese crisps up and the eggy insides cook through, about 5 minutes per side. Ideally you want the cheese to frico/get extra crsipy, so patience is a virtue! When both sides are cooked to your liking, serve with sour cream and a generous amount of green onions. Enjoy! 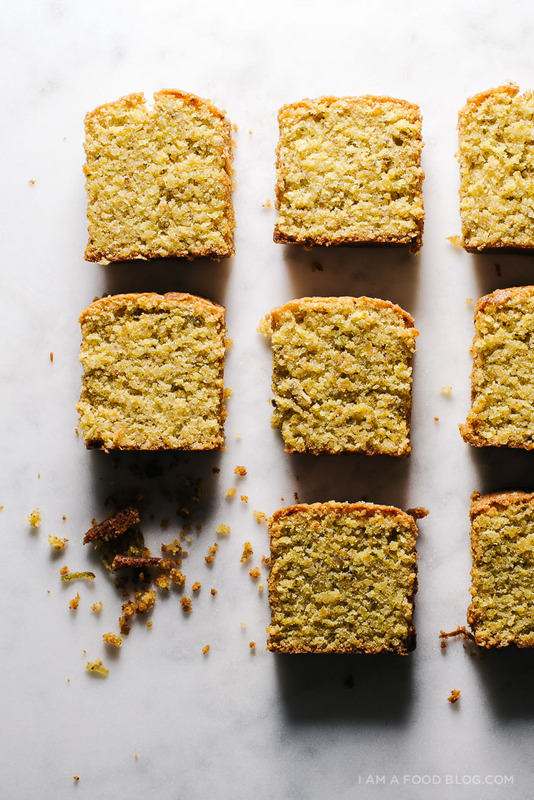 as much as i love sugar, i’ve hit my sweets limit for the moment and savory things sound so delicious (especially when there’s custardy, frico-ified goodness!). Oh my that cheese crust! Some true cheeseporn over here! The cheesier, the better no matter the category! This French toast is a total babe. Enjoy Minneapolis – it is wonderful and so magical in the snow! If you have time, make sure you get dinner at Bar La Grassa, brunch at Bachelor Farmer, donuts from The Baker’s Wife, and coffee from Spyhouse (just to name a few!). Aaaaaand the Cuban food at Victor’s is simply wonderful too! You’re going to be in my neck of the woods! It’s going to be (relatively) warm here in the Twin Cities, so it’s a good week to visit. 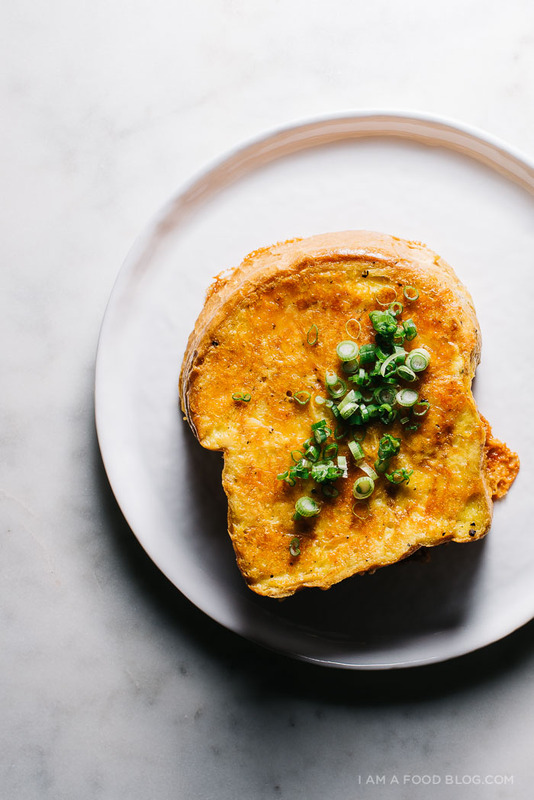 Minneapolis is one of the best foodie cities in the country! We just don’t get talked about as much as New York or LA. Check out Ramen Kazama or Zen Box Izakaya for some of the best ramen in the TC area. 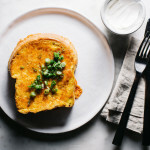 I love the idea of a savory French Toast!! This looks so good! okay this looks amazing and now I’m so hungry aha! it’s like a french toast married with a grilled cheese! what a perfect combo. Yummy! You’ll love MPLS. So much to see and do! Happy Sunday! Have fun in Minneapolis and stay warm! I love this idea! What’s better than french toast… cheese toast turned into french toast. thanks for sharing, and stay warm on your trip! This is amazing, Steph! I can’t wait to try it this weekend! Crispy, savory and cheesy!?! I’m hooked, can’t wait to recreate this one. Just tried this and it was beautiful, added my own twist by putting chopped up basil with it!